Walrien looked the wasteland. There was no sight of the others. He was in a rebellion created for the new Project 2 slavery project. As he looked around Shuckle called him over. They both went and saw the rest of the group, Salamence, Chansey (shiny), Arcanine, Qwilfish, Golem, Claydol, and Scizor. Walrien showed a small metal crown of some sort that he found. The others wondered. STOMP! They stepped back, when the wall dell into peices. Regigigas grabbed Arcanine and Chansey and quickly left. The others decided it was now or never to go after it, and save their friends. At the abondand lab, Chansey was held in a fish bowl; Arcanine was tooken away. Chansey climbed out and searched for her friend. She peaked and saw Red lazers firing at Arcanine with the same item Walrien showed them, exept it was a little different. The red lazers stopped, and Chansey saw Arcanine fall to the ground. Was he Frozen? He couldn't be dead! Suddenly, there was a loud thump. "Greetings, future people. I am Professor Oak. I shall explain, Project 3. There are 4 parts. Each one takes souls of Pokemon, and when all four are together, it realease the souls. I need you to collect all 4 parts, and take the new project's soul. Then realease it. The future deponds on you," Just then, the hologram stopped. A Bird-like shadow was in the air. Then CRASH! The legendary Ho-Oh appeared. Unable to escape the pokemon backed away. Golem ran toward Ho-Oh, but was knocked back by it's foot. GGYYYYOOOOOOOO! 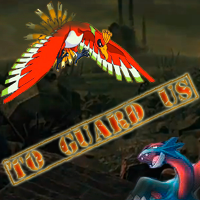 Golem broke the wall and escaped through there; while Ho-Oh chased after her, the others took the door. Walrien and Salamence couldn't make it to the door in time. They had to take the hole in the wall. Both of them exited the and saw Golem; she was lifeless on the floor. Both not knowing what to do. Salamence then charged at Ho-Oh, but is easily countered. Just then, Qwilfish came out and hit thge beast with a Waterfall. Then quickly grabbed the peice Ho-Oh had used to kill Golem, and killed Ho-Oh right back. The rest of the group met later. One part left, but they knew where that last part was, could they ever get it back? WalrusAtWar wrote: Walrien looked the wasteland. There was no sight of the others. He was in a rebellion created for the new Project 2 slavery project. As he looked around Shuckle called him over. They both went and saw the rest of the group, Salamence, Chansey (shiny), Arcanine, Qwilfish, Golem, Claydol, and Scizor. Walrien showed a small metal crown of some sort that he found. The others wondered. STOMP! They stepped back, when the wall dell into peices. Regigigas grabbed Arcanine and Chansey and quickly left. The others decided it was now or never to go after it, and save their friends. WalrusAtWar wrote: Part two made! When is part three gonna be made?